Helped by Dr. Daniel Jackson, Colonel Shepherd’s team fight not only to save their city and free their friends, but ultimately to save an entire species from extinction. As tensions rise between the Wraith, the Travelers, and the Lanteans, old enemies — and long lost friends — must unite to walk a third path if the fragile peace in the Pegasus galaxy is to hold. In this riveting conclusion to the epic Legacy series, the destiny of Atlantis and her people will be decided. 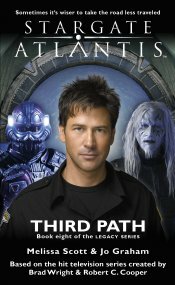 This is the conclusion of the highly popular and successful STARGATE ATLANTIS Legacy series by Melissa Scott, Jo Graham and Amy Griswold. For a complete list of the Legacy books, click here. “In some ways,” Teyla said. Of course Elizabeth was not aware of the silent conversation. She knew nothing of Rodney’s experiences with the Wraith, or of how they had left him with the residual Wraith telepathy that allowed him to speak privately with her. “According to the reckoning of your people, today is February 24, 2010,” Teyla replied.